Unfortunately, Rock Creek Park is home to more than 200 species of plants that are not native to the eastern United States, yet have made themselves at home in the natural communities of the park. What Is the Park Service Doing? 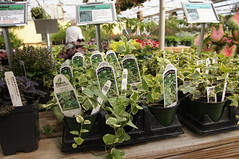 Click on highlighted plants in the list to see photos and dig deeper. Learn about species that take priority at the park for removal. Click on the title to see a flickr album of Rock Creek Park's "least wanted." 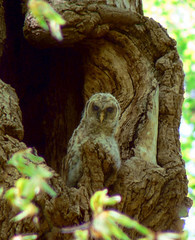 Old, hollow trees are good habitat for barred owl nests, but choking vines can topple them prematurely. Photographer: Julie McCallNon-native invasive plants often create problems for native animals as well. For instance, many lowland forests at Rock Creek host cavity-nesting owls, woodpeckers and other animals in standing dead trees. In many areas, including some near Dumbarton Oaks, porcelain-berry vines have smothered the vegetation, toppling dead and weak trees, and destroying habitat for cavity-nesting animals. In Rock Creek Park, non-native invasive plants are most prolific along roads, trails and waterways (where they are probably easily dispersed), and in clearings, meadows, and successional forests. Although some can grow in the forest shade, many prefer more sunlight, and hence are commonly found in sunny or edge habitats (such as the forest edge along trails, providing some sun, some shade). Invasive plants at Rock Creek are possibly the greatest threat to the ecological well-being of the two natural communities where the soils are most fertile and moist, the Basic Mesic Hardwood Forest, and the Tuliptree Small-stream Floodplain Forest. They are least often found in the driest upland forests because most of them prefer fertile soils and moisture. Where Do Non-Native Invasive Plants Come From? Many non-native plants that make good groundcover become weedy headaches well beyond the owners' property lines. Historic plantings to beautify D.C.
Once in the park, they continue to spread! Where Do They Grow at Rock Creek Park? Knowing something about the growing conditions a particular non-native invasive plant can tolerate will help you predict where you might find the plant at Rock Creek Park—and which natural communities it might threaten. In the following lists, the asterisk* indicates a non- native plant . Explore the Stewardship & Ecological Threats page of any of Rock Creek Park's natural communities to see which non-native invasive plants are among the biggest troublemakers there. (Find links under Learn More.) Read up on the Physical Setting of that natural community . Now that you know something about their habitat preferences, can you see why those non-native plants are successfully making inroads in that community? What Is the National Park Service Doing? Rock Creek Park staff, in collaboration with partners and trained volunteers, are actively removing these and many other non-native invasive plants from previously selected areas. They use a variety of methods of removal. Civic groups who partner with Rock Creek Park to tackle the very big challenge of non-native invasive plants include: Rock Creek Conservancy, Dumbarton Oaks Park Conservancy, and Casey Trees. Find opportunities to volunteer with Rock Creek Park. Team up with Dumbarton Oaks Park Conservancy, a citizen-based, non-profit organization that focuses on the restoration of a 27-acre historic gem in partnership with Rock Creek Park. Take a Non-Native Invasive Plant Removal class at Casey Trees to learn how to identify species of non-native, invasive plants in Washington, D.C.